1. Go to the project’s page. 2. On the Bids tab, locate the freelancer whom you wish to award the project to. 3. Click Award on the freelancer’s bid card. 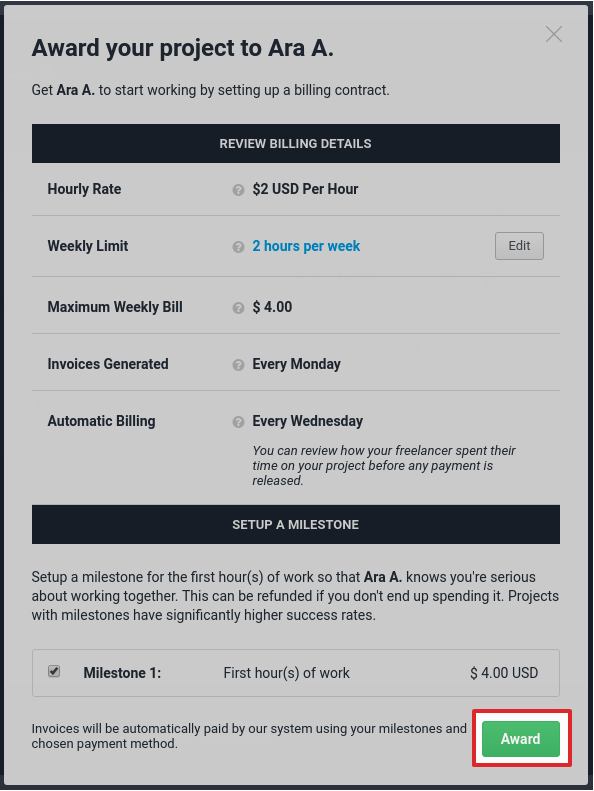 If your project is an hourly one, setting up weekly billing first is required before you can award your project to a freelancer. 4. Check the billing details, and click Award to finish. If you wish to award more than one freelancer, go to the Management tab, and click Award Another Freelancer. You can take advantage of our Recruiter Service if you need help in selecting the right freelancer. Our Project Recruiters can help connect you to the best freelancer for your project, which may also be one of our Preferred Freelancers. Остались вопросы? Наша замечательная команда Службы поддержки клиентов готова помочь вам.